Lunch often gets overlooked because breakfast is considered the most important meal of the day, and dinner gets the spotlight, but your digestive juices peak at midday so this is one meal you don’t want to skip over. Here are plenty of recipes to keep you happy during your workday, or any day. They’re all made in a health conscious way, so you can enjoy them without guilt and many are made quickly and easily. Lunch often consists of eating what you didn’t finish the night before. It’s a cost conscious way of eating that can also be delicious if you play your cards right. These recipes will get your creative juices flowing, and help you empty out your fridge at the same time. 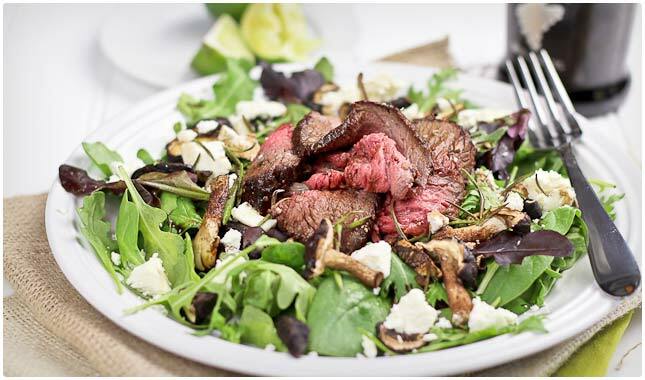 Leftover Roast Beef Salad with Shiitake Mushrooms – This recipe looks like the kind of salad you’d get at a restaurant, but the secret is they’re using last night’s beef to get the job done. The roast beef packs protein, the shiitake mushrooms are a bona fide superfood with too many benefits to list, and the greens from the salad give you plenty of nutrients. A well-rounded winner made with leftovers. Stuffed Bell Pepper – For this recipe they’ve taken leftover taco meat and turned it into a brand new meal. The pepper itself gives you your veggie serving, the taco meat is your protein. They had some black beans with their tacos, which serves as a carb, so if you don’t have black beans when you have taco night you’ll have to come up with your own way to round out this meal. What results is a totally different meal that is quick to assemble and makes a nice lunch. Skinny Calzones – It’s not very often you see the word skinny and calzone in the same sentence, but this title says it all. It’s very easy to use up any leftover vegetables you have on this, including the peppers, onions, and mushrooms. These are ingredients that just seem to end up in a lot of recipes, and often you have some left in the refrigerator or countertop. This is a recipe that also lets you get creative, adding other veggies not listed here to make the calzone taste the way you want. Buckwheat Stuffed Bell Peppers – Here’s another way to use up any leftover ground beef that you might have. They add buckwheat to the mix so you’re getting a pepper that is stuffed with both meat and grains, which works well together. You can experiment with different colored bell peppers, since they each have a subtly different flavor to them and can change the dynamic of the meal. 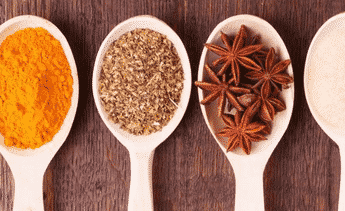 Paprika and cumin add some flavor and are good spices to use if you’re watching your waist. Thanksgiving Monte Cristo Sandwich – They say this uses up your Thanksgiving leftovers, but if you’re the type of family that likes to have a Thanksgiving style meal once in awhile throughout the year, this is a great follow up for lunch the next day. Typically a Monte Cristo would make it onto our Unhealthiest Foods List, but the way they make this gives you all of the taste, without the deep frying and fattiness. Baby Corn And Green Peas Rice – Here is a simple way to take common leftovers and make a new meal out of them. The rice and corn will give you carbs, while the peas fill in for your veggie. This makes a great side dish to any protein if you’re trying to round things out, or it acts as its own vegetarian meal. Rice is a common leftover, and it’s sometimes hard to figure out what to do with it. Crockpot Tex-Mex Quinoa Recipe– We love this recipe because it gives you Mexican flavor, but also uses quinoa so you’re keeping things healthy. It’s not everyday that you can eat tacos and not feel like you’ve fallen off your diet plan. These include the use of avocado, so you’re going to get the health benefits that brings, including healthy monounsaturated fat. Squeezing a lime gives it extra flavor, and the goodness of citrus juice. Leftover Squash and Rapini Frittata – If you ever end up with leftover squash and rapini you’ll know what to do. But the joy of this recipe is that you can use a bunch of different leftover items using the frittata template. She gives you plenty of different ideas for things you can include in it, so get your imagination going, or start cleaning out the fridge to find suitable foods that can be reused. Burgers can make a quick and healthy lunch, and keep you away from fast food restaurants as well, serving as a double bonus. Here are 5 ways to make a healthy and satisfying midday burger, without having to loosen your belt after lunch. 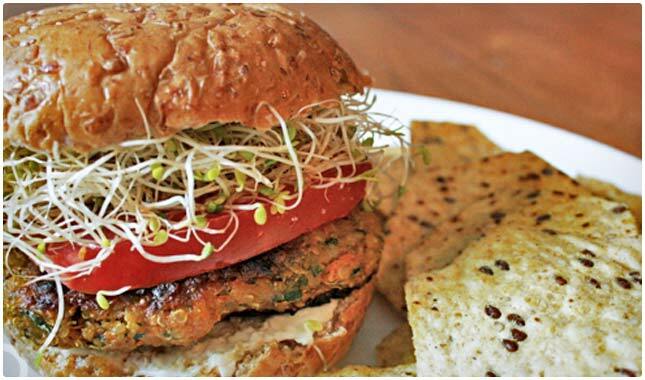 Vegan Sweet Potato Quinoa Burgers – These burgers end up looking great, with the sweet potato giving them a nice color. On top of that they’re using one of the most popular health foods going right now, quinoa. This is going to give your burger all the texture you’d want, and flavor you wouldn’t expect. They’re also using kale, chopped up so small you won’t notice, but it still lends its flavor as well as all of it phytonutrients that are so important. Sweet Potato Chickpea Burgers – Here’s a mammoth burger that will definitely leave you feeling full, but shouldn’t slog you down either. They’ve replace the typical beef patty with a mixture of sweet potato and chickpeas, and they also have some beans in there for good measure. The result: you’re getting plenty of fiber from this, as well as nutrients from the different ingredients and carbs from the bun. Success! Fire Roasted Chile and Garlic Chicken Burgers – Chicken makes a great stand-in for beef, giving you all the protein you could ever want, without the saturated fat and higher calories. They’ve infused this with the flavor of the roasted chilies so you’re not going to complain about the taste. The garlic rounds things out nicely. Switch this to chicken breasts instead of thighs so you’re getting a higher quality protein with less fat and fewer calories. Around the World Black Bean Burgers – The black beans as a base will leave you feeling satisfied for several hours, and the mix of spices will have you returning to this time and time again as your new go-to lunchtime burger. They’ve used whole wheat flatbread in the picture, which helps to cut down on the carbs, and also gives it a nice presentation. They say that it tastes great with a side of kale, and that’s an easy way to add a lot of nutrients to the meal. Quinoa, Beet and Chickpea Burgers – Quinoa is the star of the show here, but you also have to love the fact that they’ve incorporated beets into this recipe so you’re getting two superfoods acting in harmony between one bun. The beets give it an amazing color that you probably haven’t seen on a burger before. The chickpeas act to add even more texture and their own flavor so you won’t have to worry about feeling like you’re missing out on meat. Pizza is great anytime of the day, and it also works great as a lunch item. The trick is that you have to make it in a healthy way, but also make it delicious. Try these recipes for fast and delicious pizza that won’t weigh you down the rest of the day. Mini Veggie Pizzas – This is a great pizza to make when you’re on a time crunch, which usually happens around lunchtime. By the time most pizzas are going in the oven this pizza is going into your mouth. The use of a pita for the crust takes out the crust-making time, and the use of simple, wholesome veggies keeps it healthy and makes it super easy to make. It’s also versatile, allowing you to put any veggies you choose on it. 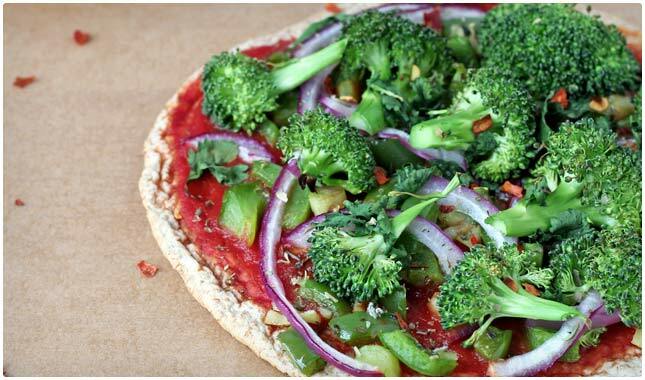 Veggie White Pizzas – Using a mushroom for the crust is starting you off on the right foot, since you won’t be getting the carbs associated with pizza crust. The cheese is Parmesan, and they recommend using organic ricotta and mozzarella. If you’re in the mood for a delicious white pizza, this is the way to go. The mushroom and eggplant balance out the cheese you’re using, and if you keep it organic it’s not as bad for you as it might seem. Mango Basil Personal-Sized Tortilla Pizzas – Here’s a fun lunch because you get your very own personal pizza, just like at a restaurant. It’s very creative because they’re using a tortilla as the crust, keeping it easy, delicious, and healthy. The mango and basil go together nicely. The tomato sauce gives you lycopene and there’s just enough cheese used to make it a pizza, without going overboard and making it fattening. Skinny Pizza Rolls – We had to do a double take with this recipe, because everyone likes a good pizza roll, but it’s usually a guilty pleasure. Here’s a way to get the same sort of flavor without having to run an extra mile at the gym. The total cook time on this is about 30 minutes so this is a lunchtime or snack option that won’t have you working away in the kitchen. They say this is an award-winning recipe, and it’s easy and yummy to see why. Peach, Arugula, and Ricotta Pizza – Peaches on a pizza? You’ll be a believer too once you try it out. The arugula adds its signature peppery taste to the dish, so what you’re left with is a sweet and spicy and cheesy result. It’s not your typical pizza, but it’s easy to get used to. They have a recipe for a balsamic reduction, and it’s highly recommended that you go with this option for added flavor, and a splash of dark color to contrast the light dough. Check out more pizza recipes here. Rolls and wraps are great because they’re portable, so if you’re doing an on-the-go lunch you’ll be glad you packed these. They provide a well-rounded meal and are also healthy and taste great. They are also great for packed lunches, often retaining their shape well. Soba Noodle Salad Rolls with Peanut Sauce – Here’s a salad that’s a roll, packed with noodles and peanut sauce to give it an Asian theme. The soba is a buckwheat noodle that’s big in Japan, and when mixed with the likes of carrots and peppers you’re going to get lots of different flavors competing for your attention. The peanut sauce makes a nice addition and adds some novelty to the meal. Shrimp and Avocado Summer Rolls – These take spring rolls to a whole new level by adding a good dose of protein from the shrimp, and some nice texture and healthy fat from the avocado. If you’re used to vegetable spring rolls, you’ll appreciate the subtle flavors of the shrimp and avocado, and how they still let you taste the cabbage, cucumber, and carrots in these rolls. Greek Veggie Wraps – These wraps resemble a Greek salad all wrapped up and portable for an on-the-go lunch. Bursting with flavor from items like olives, tomatoes, onions, and spinach, you’re looking at 10 minutes total to put this together. Make it enough times and you can definitely get your time down. The tomato wraps add flavor to the meal, and help you skip the bread, which often adds too many calories and carbs to a meal. Spicy Chicken Wrap – The chicken in this gets tucked away in a nice bed of arugula so it wouldn’t be the main focus if it weren’t for the spiciness which comes via sriracha sauce mixed with mayo. Use a teaspoon of mayo instead of a tablespoon to cut down on the calories and fat instantly. You can also sub in chicken breast instead of the drumstick for a better protein. The rest of the recipe is good to go, and this is one way to eat healthy at lunch. Terah’s Delicious Lettuce Wraps – Lettuce wraps are just fun to assemble and devour, and these are no exceptions. The teriyaki flavoring puts them over the top on taste, and the fact that you’re using lettuce in place of bread or a wrap means that you’re coming in low on carbs and calories. They say you can use a low-fat sesame dressing to go with these, and that works well to add even more flavor and helps with some of the dryness of the chicken. 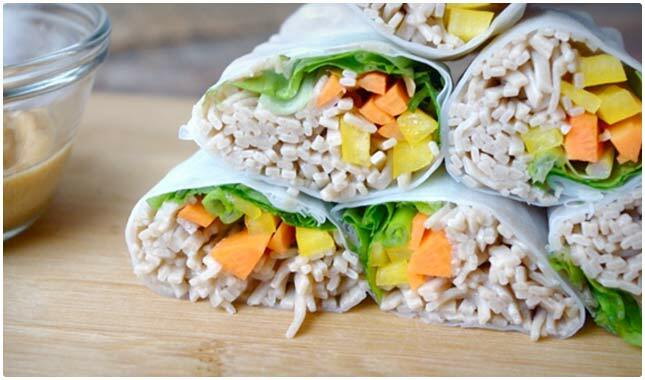 Super Tasty Chicken Wraps – If you call something super tasty you’d better bring your A game. They pull it off by using a select blend of spices and ingredients to get the chicken just right, and then top things off by using a guacamole spread that you’ll likely end up using in other dishes you make. These wraps keep it healthy with low-fat sour cream (try Greek yogurt if you don’t like buying low-fat items) and low-fat wraps. Salads make a nice light lunch, and if you pair them with some of the soups listed here you’ll be all set. Several of these make their own well-balanced meal without needing to have anything with them. Of course if you want a bigger lunch you can add a soup or sandwich with them. 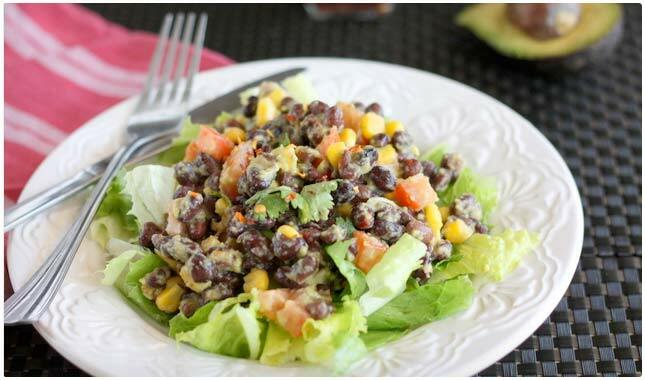 Spicy Black Bean Guacamole Salad – Spicy foods are very satisfying because they get your taste buds revved up. They’ve also been shown to help get your metabolism going. Here we have black beans providing a “slow carb” to help regulate blood sugar levels and avoid a midday crash, and the avocado in the guacamole adds even more nutritional value. Served over a bed of romaine this salad will rock your socks. Warm Spinach Salad with Bacon, Mushrooms & Eggs – The eggs provide the protein that will leave you feeling good after lunch and cruise right on to dinner. The spinach provides its classic nutrients, and the bacon can be optional if you’re strictly cutting out fat, or switched to turkey bacon if you want the taste but not the extra fat. Mushrooms and onions join the party and this becomes a well-rounded meal. Grilled Vegetable and Tuna Salad with Salsa Verde – This is a bowl you won’t soon forget, and it uses tuna to supply protein as well as omega-3s. It also has avocado to give you healthy fat, and asparagus to help your body get rid of toxins, and help you prevent things like heart disease and cancer. They’ve snuck so many vegetables in here, like zucchini and eggplant, all while keeping it gluten-free. Almond, Cashew Chicken Salad on Ciabatta – Celery often pops up as a health food, but it is really good for you, and it’s used in this chicken salad recipe. The almonds add another superfood into the mix, the cashews give it extra flavor, and the chicken used is boneless and skinless, packing in the protein without the added fat and cholesterol. The amount of mayo used gets spread among 4-6 servings so it’s not a huge setback. Tuna Tomato Bites – Here’s a unique way to present tuna salad, while also adding another healthy food with the tomatoes. The tuna supplies protein and other minerals without adding fat, just opt for the albacore variety. There is also cottage cheese for more protein, and avocado can help prevent cancer, and help you lose fat because of its healthy fat content. These can be ready in just 10 minutes, making them a great last-minute lunch idea. Tuna Salad Endive Crackers – They show you several different ways you can use endive, which most of us don’t really incorporate into our cooking. The one that caught our attention involves using the endive as serving trays for a delicious tuna salad. Presentation points galore, and also extra healthy with the use of lentils, plenty of metabolism boosting spices, tomatoes and avocadoes so it’s really a meal, but could also be used as an appetizer at a party. Chinese Chop Salad – The nice thing about eating a chopped salad is that you don’t have to worry about pieces of lettuce that are too big. It’s already been chopped up nicely so you can just eat it. This salad is a thing of beauty, not just because of the way it looks, but for what it contains. Ingredients like toasted almonds, romaine lettuce, and just a bit of ramen noodles for crunch and flavor. Topped with low-fat dressing you’re all set. Mexican Salad with Kale and Heirloom Tomatoes – Kale all by itself is going to bring you so many nutrients, but they don’t stop there, giving you lycopene in the tomatoes, and black beans supply extra fiber and fill you up. There’s also avocado in there, and it’s kept in good-sized chunks so you can really taste it and get its texture. Not to mention it’s a wonderful superfood. This take on a Mexican salad is sure to be a crowd-pleaser. Nothing is more classic than a sandwich for lunch, but some sandwiches can really hold you back as far as eating right goes. There are sandwiches that tip the scales at 1000 calories or more. But not these, so go ahead and enjoy them without the guilt. Better Than a PB&J – If you like a good peanut butter and jelly sandwich, but don’t think you can have one while you’re watching your weight, here is a way to get the flavor but in a healthier way. This is a sandwich Elvis would have approved of, as it uses his famous mix of peanut butter and bananas. You get potassium and fiber from the banana, healthy fat from the peanut butter, and a little sweetness and tart from raspberry jam. Open Faced Tuna Sandwich with Avocado – Making a sandwich open faced is a good way to split the difference as opposed to using two slices of bread. You get the flavor and substance of the bread with half of the calories and carbs. Tuna is great to use for a sandwich, as it balances nicely with the bread, and provides both omega-3s and protein without boosting fat totals. Avocado and plenty of veggies assist in making this a fantastic lunch. Veggie and Hummus Sandwich – Gone is any meat, and in its place is hummus. If you’re usually a meat-eater you might scoff and say that there’s no way this sandwich could keep you full and get you through the remainder of your workday, but try it first and sea. There’s something about the chickpeas used in hummus that hits the spot without making you feel bloated or stuffed. You’ll be clear-headed and ready for what’s next. Grilled Turkey Sandwich With Basil Aioli – The roasted turkey breast in these sandwiches is a nice start, adding copious amounts of flavor without adding a lot of fat. Turkey breast gives you protein, but not a lot of fat and cholesterol. The basil aioli is what puts this sandwich on the charts, and will really make your mouth water when preparing it. Grilling it up is just like putting icing on a cake. Delicious! Curried Chicken Apple Salad – Cubes of curried chicken make this sandwich an instant favorite. If you like curry chicken, and you like sandwiches, you’re sure to like this one. The use of apples adds a nice sweetness to things, and also boosts the nutritional value of the meal. What you end up with is a recipe that keeps things healthy by using items like Greek yogurt for the creaminess instead of fattier options like mayo. Avocado Egg Salad Sandwich – Protein, healthy fat, and whole wheat bread, what’s not to love about this sandwich. It has you covered on all counts, even including salad greens so you’re making sure to eat your vegetables. The use of hardboiled eggs means you’re avoiding the use of any extra fats or oils to cook them, and it’s a dish you can pre-make ahead of time so you have everything ready when lunch rolls around. 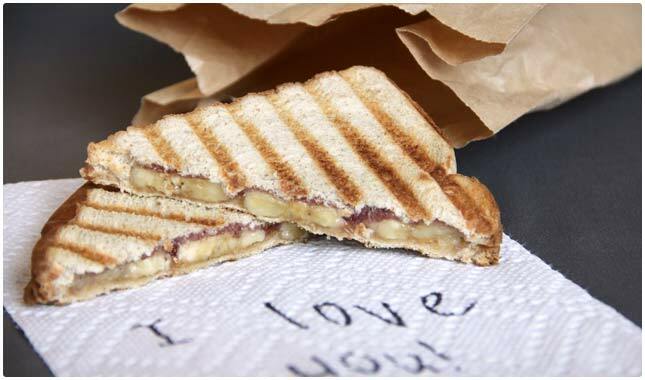 Peanut Butter Banana and Honey Sandwich – Here’s another peanut butter-based sandwich that also uses bananas, and adds some honey to the mix as well. The benefits of honey have long been established, just don’t overdo it. 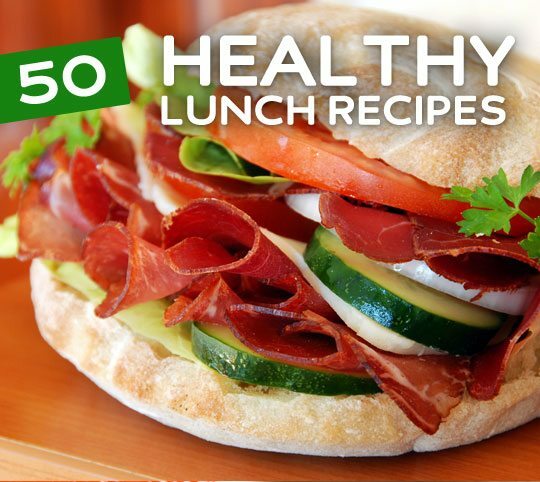 This recipe is great because they’ll actually show you how to compliment this sandwich with other healthy lunch box goodies, for yourself or your little one. Creamy Avocado Salad on a Croissant – The amazing assembly of ingredients here is one that you’ll want to savor as you eat it. The avocado is a good way to start things off, with it’s creamy texture and plenty of healthy properties. She’s also using plenty of light veggies like cucumber which contains a lot of water to help you stay hydrated and focused through the day. There’s also an egg for protein, Greek yogurt for more creaminess and texture, and feta cheese to wow your taste buds. Healthy Egg Salad Sandwich – Egg salad is a nice lunch to make because a lot of the prep work can be done ahead of time, and leftovers store easily so you can make it last until tomorrow. This recipe turns things on its head by cutting out the mayo entirely, so no worries about all of that fat and calories. You’re also able to tinker with the recipe, adding a bit of mayo to make sure it still tastes the way you want it to. Turkey Club with Creamy Rosemary Spread – Turkey breast makes a great lunchtime protein, and will help you stay focused while on the job, even with the tryptophan. They’re using center cut bacon to try to keep things lean, but you can also opt for turkey bacon to make sure that you’re not getting too much fat and cholesterol. The creamy spread is made with Greek yogurt, so it’s one creamy item that you don’t have to worry about. If you’re looking to get all of the satisfaction of a full lunch without the time it takes to make a meal, these smoothies and shakes are built to provide you with vitamins, minerals, and protein to propel you through the rest of your day. 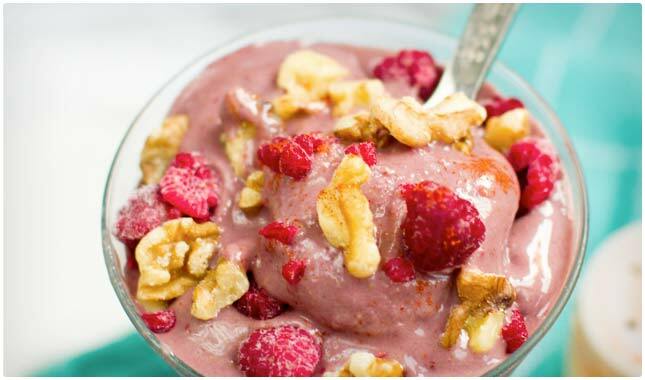 Vanilla Berry Smoothie – Here’s a way to get antioxidants into your system, and fast! The raspberries will provide those, and she also includes a version where you’re using protein powder to make this extra healthy and filling. There’s also a banana in there for good thickness, and almond milk replaces ordinary milk to make it dairy free. Charissa’s Favourite Superfood Smoothie – Charissa got it right when she decided to use a concoction of superfoods together. They contain a fantastic amount of antioxidants that go to work on the free radicals in your body. If you’re having a stressful day at work or at home you probably have more free radicals than usual, and this smoothie can help you out big time. It’s packed with berries, spinach, avocado, and plenty of protein to keep you satisfied. Dashing Dish™ Protein Shakes – Here is a lineup of protein shakes that you can return to time and time again since they’re so satisfying and use healthy ingredients so you don’t have to feel roped into buying expensive protein shakes from health food stores. They even give you a base to work from so you can concoct your own creations. Honey and Walnut Spiced Protein Shake – Low fat cottage cheese starts this shake off on the right foot, providing plenty of protein, and giving it a thickness as well. Protein powder gives the assist so this is a protein packed shake. Walnuts give your teeth something to do, and also add their own healthy fat and nutrients. See more healthy smoothie recipes. If you only have a big bowl of soup it can be a light meal, but it also plays nicely with sandwiches and salads. These soups are hearty enough to make their own lunchtime treat, or you could have a small salad or a half sandwich with them, it’s up to you. 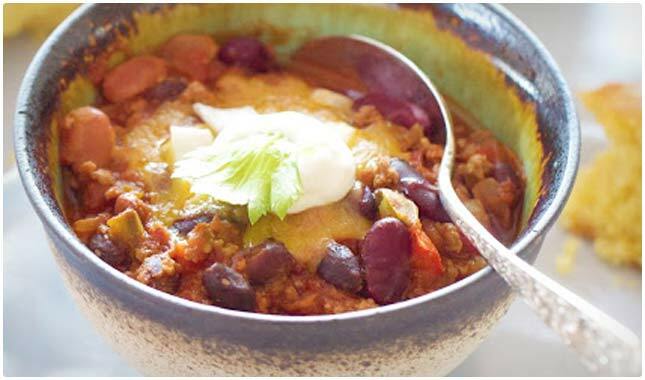 Chili with Chipotle – This recipe uses three different beans, so you’re going to get plenty of fiber, and a good amount of protein. She also says that it’s easy to make changes and substitutions on this recipes, which is always nice when you don’t have the exact ingredients being called for. We like that she’s suggesting you use organic beans, since they form the foundation of this meal. Consider using a dollop of Greek yogurt in lieu of the sour cream. Overall, a fantastic chili to add to your list of lunch possibilities. Four Grains Soup and Potato Stuffed Flatbread – This is a soup that really does eat like a meal due to the ingredients that make it up, and the flatbread you serve with it. You’re using barley and lentils here, and it’s best to go organic with these as conventional crops will use plenty of chemicals to help them grow. The flatbread recipe is something you can keep on file for future use. Minestrone Soup with Chicken Meatballs – Minestrone soup on its own makes a great starter to a meal, but when you add the chicken meatballs you now have a complete meal with a protein, vegetables, and carbs in the form of the pasta used. This is an easy dish to whip up and then let simmer while you’re doing other things. Creamless Creamy Tomato Soup – Most dieters run from cream based soups, but here’s one you can embrace. Most tomato soups have a cream base, which negates a lot of the healthiness. They pull off the “creamless cream” by using pieces of bread, which break down into the soup and leave it thick and creamy without adding fat. This recipe also had grilled cheese croutons so you get the full experience. See more healthy soup recipes. No matter how busy you are, there are recipes on here that you can make in order to feel good and give you a short break in the middle of your day. You might be tempted to skip lunch, but that isn’t good for your metabolism, and it’s nice to have a substantial meal at this time so that your body has fuel to carry it through the day and get done what needs to get done. Want to satisfy your sweet tooth without the added guilt? Check out our list of healthy dessert recipes. I would like to know what is on the sandwich in the picture at the top of this post. LOOKS LIKE CHIBOTA BREAD, TOMATOES, PRISCHUTTO MEAT, ONION, CUCUMBERS, ROMINE HEARTS OR SPINACH MAYBE, AND FILIPINO WHITE CHEESE?